In order to curb the practice of declaring unaccounted income as exempt from long-term capital gains by entering into sham transactions, the Finance Act, 2017 amended the provisions of Section 10 (38) of the Act. 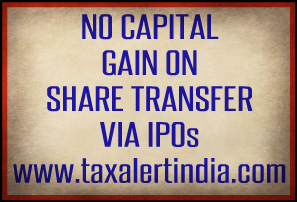 These meant exemptions under this section for income arising from the transfer of equity shares acquired on or after October 1, 2004, would only be available if the acquisition was chargeable to STT. This means that if an investor purchases shares of a listed company off market, he will not be able to claim capital gains tax exemption on sale of such shares even if the shares are sold on the stock market," said Rajesh Gandhi, partner, Deloitte Haskins & Sells LLP. He said this will have significant implications for all types of investors, specially private equity investors and strategic investors, which generally purchase a large quantity of listed company shares outside the the stock exchange and could adversely impact the financial modeling and returns of such investors.